Aluminum Fences of Distinction by Jerith provide attractive, maintenance free security for commercial, industrial and multi-family applications. They are the perfect choice whenever it is necessary to add safety and protection, yet complement the architectural or landscape design. 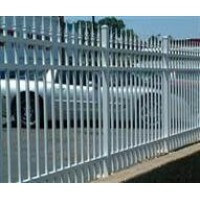 Two grades of Jerith Aluminum Fence are best suited for these applications: Regency and Industrial. While the Regency Fence is ideal for many applications, our Industrial Strength Fence offers maximum security for high traffic areas which warrant the use of a heavier and stronger product. We also produce a Residential fence for applications that do not require the extra strength provided by our Regency and Industrial grades. All Jerith Aluminum Fences are constructed of an exclusive high strength aluminum alloy called HS-35™. This remarkable material has the strength of steel, but will never rust, even in coastal areas. Plus, Jerith’s tough powder-coated finish is guaranteed not to crack, chip or peel for the life of the fence. Our long-lasting powder coating, called FencCoat™, is an environmentally safe, high quality alternative to paint. It is far more durable, fade-resistant, and scratch-resistant than other coatings (including other powder coatings), which is why we include a Lifetime Warranty on our finish. Quality has made Jerith an industry leader for over 40 years. 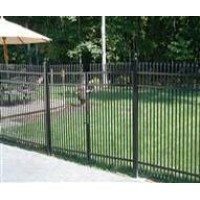 Insist Aluminum Fences of Distinction by Jerith when you want the best in ornamental fencing. Start Shopping our Commercial Aluminum Fence Materials Today! Aluminum fencing is definitely a cost-effective option – you are investing in a rust-resistant product that will last you a lifetime!